Corfe Bears > Charlie Bears > MINIMO LACE 6"
She is part of the WEDDING BELLES SERIES, which includes TIARA, DIAMOND and GARTER. LACE has the finest beige mohair on the arms, legs and head and this is quite sparse, as you can see the darker backing material showing through and she has luxurious pale cream alpaca on her tummy, muzzle and outer ears. 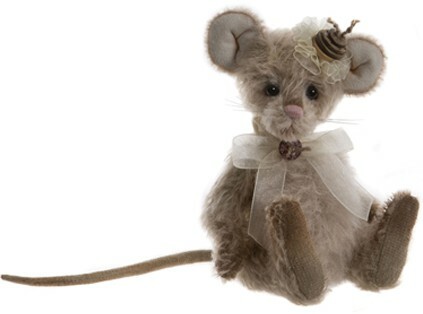 She has a cute pink hand-stitched nose and mouth, tickly whiskers, big ears and a long tail. She is accessorised with a pretty cream headpiece, that is adorned with stacked buttons and she also wears a pale cream organza ribbon that is fastened with a button. Lace Minimo is a fully-jointed, miniature mohair bear from the Charlie Bears 2019 Minimo Collection.